Jennifer Walters was an up-and-coming member of a prestigious New York City law firm when she was struck by a speeding luxury car while walking to work. She would have died of blood loss had her cousin not happened to turn up, allowing for an emergency blood transfusion. Doctors were surprised by her quick recovery afterward, though she complained of consistent pain unrelated to her accident, comparing it to "growing pains". Roughly a month after the accident and her amazing recovery, Jennifer transformed for the first time while watching a baseball game at home, gaining almost a foot of height and a great deal of muscle. Partly terrified and partly amazed, Jennifer realized that her cousin might have some connection to the urban legend of a "monstrous hulk" roaming the country. Her powerful new body brought with it a sense of confidence and power that she'd been lacking before, and she let the world see it without shame or fear. Unfortunately, things didn't stay coming up green roses. Jennifer's law firm fired her quite promptly upon her return to work, attempting to cite the amount of time she'd taken off work (to learn to control her enhanced strength). While prior to her transformation she might have meekly accepted this, the new Jennifer wasn't having any of it, and sued her ex-employer for discrimination. During the process of the trial and the research it entailed, Jennifer realized that the growing field of metahuman-related law was largely untapped potential, as there was currently no one who truly specialized in such matters. Once the suit was resolved (in her favor), Jennifer took that and the also sizeable settlement from her suit against the driver that hit her and opened her own law firm, specializing in representation for metahumans and those affected by metahuman events. Jennifer prefers not to label herself a "superhero" or a "metahuman", but as a "person with powers". To that end she focuses most of her energy on her professional pursuits and activism, rather than seeking out a team to join or actively fighting supercrime as a primary goal. She primarily becomes involved by happenstance or opportunity… if a supervillain starts a rampage a few blocks from her office, she goes, or if she sees a bank being robbed while she's out jogging, she stops them. She's usually ready and willing to fulfill requests for help from other heroes, however… she enjoys the adventure of it, and to a certain extent considers it a civic duty. Jennifer's sense of physical invincibility tends to carry over into her personality as a sense of social invincibility. While she can be quite politic in the courtroom, outside of it she has a tendency to speak her mind with few reservations. She hates taking guff from anybody, and her tolerance for doing so is quite low… though at least in most such occasions, she prefers to lash out with a verbal diatribe rather than her fists. The gamma infusion that caused her to become She-Hulk also makes Jennifer's emotions somewhat amplified. Though she is generally in control of herself, anything that succeeds in making her mad makes her -very- angry. Similarly, things she becomes truly passionate about she tends to pursue no matter the personal cost, and things that pierce her confidence and make her uncertain can lead to actual depression. Since her powers are tied to her emotions, this can be both a boon and a drawback. Jennifer's primary motivation is to promote the idea that people with powers are just that: people, who happen to have powers. This means they should be afforded the same respect, consideration, help, responsibilities, and above all legal opportunities that everyone else would receive. Most of her work both as a legal activist and as a superhero is driven by this. Jennifer has a high respect for the tenets of law and order… things such everyone being entitled to the best defense they could possibly receive, that the law exists and works as it does for a reason, and that people should be responsible for their own actions. These often come into conflict with the realities of being asked to represent supervillains in court, having to confront and sometimes break unjust laws in her occasional superheroic activities, and sometimes being asked to litigate against people she likes and respects. She generally tries to deal with each situation on a case-by-case basis. Jennifer is highly enamored of her powerful "hulked out" form, generally preferring to stay in it whenever possible. She likes chances to use her abilities and to push her limits, despite her life's focus being on more mental pursuits. Similarly she likes hanging out with other highly physically powerful people, and is usually pretty free with physical contact and showing off (as long as it stays appropriate). In her professional life, Jennifer often weighs each choice carefully to make sure it's the best one. In combat she tends towards snap judgments of the best option at the moment, which usually work out. Her personal life, however, tends towards a series of decisions that wind up remarked on with a rueful "it seemed like a good idea at the time", especially since she became She-Hulk. These range from extravagant shopping purchases to poorly thought-out romances. Jennifer's discrimination case against her former law firm grabbed headlines. That and the field she works in has made her something of a celebrity. She's torn between loving and loathing the attention… it's certainly something she never got before her transformation, and the fact that people want to know about her and hear what she has to say is extremely attractive. The flip side of that, the constant invasions of her privacy, she's not so thrilled about. Jennifer can transform between her human and "hulk" forms largely at will, though it requires some amount of calm and concentration. When going from human to She-Hulk, she gains nine inches in height and a great deal of extremely dense muscle mass, meaning that she's heavier and harder to move than she appears. She also, obviously, turns green. She-Hulk can lift in the range of 50,000 tons, or roughly the weight of something really amazingly heavy. Her strength is also tied to her emotions, primarily her anger… when enraged, she can become considerably stronger. This strength also allows her to leap great distances, though her control over her landing target decreases the further away it is. Primarily as a side-effect of her muscles being powerful but not bulky, She-Hulk can run and move faster than the human maximum, though her reaction time remains within human limitations. If injured, She-Hulk heals at an accelerated rate. Massive soft tissue damage or even broken bones heal within minutes. She also processes and rejects poisons, toxins, and mundane terrestrial diseases, rendering her effectively immune to being sick, drugged, or drunk (at least from normal Earth-based sources). Partly due to the way her muscles work and partly due to her healing factor, She-Hulk's body is largely immune to exhaustion and fatigue. She would have to push herself as hard as possible for roughly two days before becoming tired. While not literally invulnerable, She-Hulk's gamma empowered skin and dense musculature renders her immune to most conventional forms of injury. She can largely shrug off being shot by a tank, and similar levels of damage by energy blasts and other powers. As the recipient of two large monetary settlements and the head of her own law firm, Jennifer is more well-off financially than most people. She's far from being lavishly wealthy, but can at least afford to take time off work occasionally to fight bad guys without worrying about paying her utility bills. The law is a weapon that Jennifer wields as adeptly as any of her superhuman abilities, and if she can't punch something in the face with her fists she'll punch it in the face with litigation. Unafraid of tackling issues or using precedent more conventional lawyers wouldn't touch, she's as intimidating an opponent in the courtroom as on the battlefield. Jennifer's a high-profile lawyer for more than a few reasons, and it's pretty easy for her to get headlines. While her relationship with the press is tempetuous and she has no power over what they'll actually print, she finds it easy enough to get reporters to listen to her if she wants to talk… especially if the subject has the potential to be juicy or scandalous. 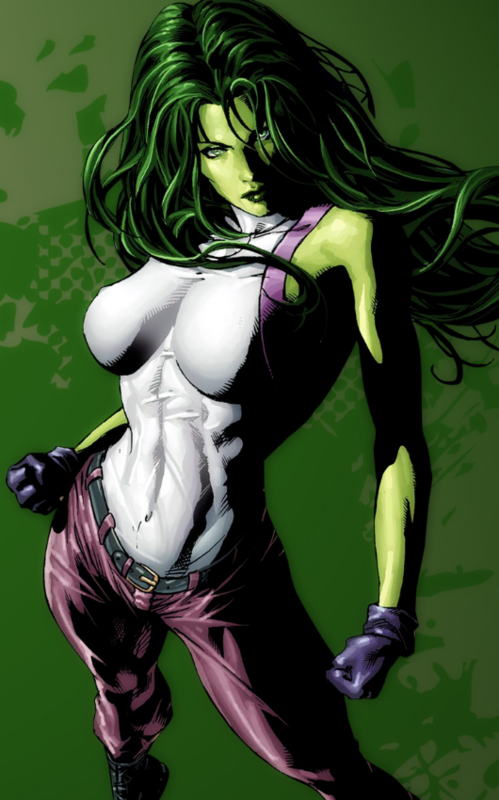 As normal human Jennifer Walters she's moderately good-looking, but as She-Hulk she's tall, toned, and *ahem* blessed. The confidence and unashamed zest for life she exudes in this form makes her attractive to a good many people. She's well aware of that, and not above playing it up to get someone's attention or just for her own amusement. Part of her settlements went towards buying a condo (which she got for a steal in return for agreeing to handle all the previous owner's tax issues until the end of time). While neither prime real estate or lavish in its appointings, it has a decent view, a balcony, and floors strong enough to handle it if she rolls over in her sleep and falls out of bed. Prior to gaining powers, Jennifer's only experience with martial arts was self defense classes. Quickly learning how effective even those basic moves could be in her She-Hulk form, she's begun taking karate lessons in human mode. Proving to have an aptitude for it, she's already capable of taking down a single larger (but less-skilled) opponent even in human form. When transformed, those skills become quite a bit more fearsome, allowing her to theoretically tangle with multiple foes of roughly equal strength and still come out on top. While in the world she lives in "genius" has taken on a whole different meaning, Jennifer is still extremely intelligent, both a quick study and a creative thinker. She attended UCLA and was a member of the Order of the Coif, marking her as exceptional among legal scholars, and went on to earn her Master of Law at Harvard. She picks up new skills with relative ease and speed, and can easily carry over even vaguely applicable knowledge. Jennifer has a masterful command of the law, enhanced by the confidence and surety that her transformation has given her. Her courtroom presence is impressive, as is her technical knowledge. Cultivated as part of her skill in the courtroom and partly simply as natural ability, Jennifer is skilled at public speaking or making statements. She uses this in court, during public events related to her activism, and occasionally in simple one-on-one venues (such as when someone has annoyed her a great deal and she wants to put them in their place). While extremely dense and borderline invulnerable, She-Hulk has no special abilities allowing her to keep from being moved. If enough kinetic force is applied, she'll get sent hurtling out of control the same as anyone else (just with slightly more survivability when landing). While she gets stronger when angry or even when afraid, the opposite is true if she becomes depressed or uncertain. If she becomes emotionally compromised this way, her strength and speed will decrease, making her much less effective in combat. Though she usually retains her intellect and rationality as She-Hulk, if sufficiently infuriated it is possible for her to lose control and completely "hulk out". In this state her strength is greatly increased, but her intellect and her ability to distinguish friend from foe are even more severely diminished. In the form of Jennifer Walters, she's just as human as anybody, possessing what's probably slightly below average strength and speed. Though her body would likely attempt to shift to her She-Hulk form in response to any truly fatal injury, she is otherwise extremely vulnerable in this state. Jennifer's transformation into She-Hulk relies on two things: the gamma radiation infused into her blood, and certain gene sequences she shares with her cousin. Should either of these be tampered with, suppressed, or removed, she would quickly revert into being merely human again, possibly permanently. She-Hulk has no secret identity, the world knows she is Jennifer Walters. While she tries to maintain her privacy, it's not that hard to find out where she lives, and where she works is a matter of public knowledge (as it would obviously have to be). While this suits her activism and ideals that she shouldn't HAVE to hide who and what she is, it can cause its own share of complications. Not literal ones, but emotional ones. Jennifer often has difficulty seeing things about people she cares about that she doesn't really want to see, for whatever reason. She puts off dealing with these issues until they inevitably come to a head, usually with disastrous results. Jennifer has some good things about her reputation since she became She-Hulk that can help her, such as: helping people seek compensation for damages from supervillain attacks, her superheroics, her beauty and approachability, her legal ability, and her activism. She's also garnered negative aspects of her reputation: defending supervillains from prosecution, causing damage during battles, her love life, her "gimmicky" court presence, and her activism. Those so inclined may only choose to see one side and not the other.